The goal of our research is the design and development of medical imaging systems. Our objective is to develop new dedicated imaging systems that have the potential to improve image quality compared to currently available general purpose scanners or enable diagnostic or interventional procedures that are currently impossible or impractical with existing tools. Of particular interest are imaging systems utilizing x-rays (i.e. radiography, x-ray tomosynthesis, x-ray computed tomography (CT)) and/or nuclear medicine (i.e. scintigraphy, gamma ray emission tomosynthesis, single photon emission computed tomography (SPECT), and positron emission computed tomography (PET)). In recent years we have focused on the development of multimodal hybrid systems that integrate anatomic and functional image sets. Current application areas include breast cancer detection and characterization, intraoperative image guidance, and pre-clinical in vivo imaging. Currently Dr. Majewski is actively working with Dr. Williams on new ideas for the next generation of dedicated molecular breast imagers (gamma and PET). Preliminary data has been collected and proposals to NIH are in development. human cardiac and prostate TOF PET imagers, in collaboration with the UVA clinical researchers in these corresponding areas. Dr. Majewski is working here primarily with Dr. Berr, but also with Dr. Kundu on the dynamic/kinetic imaging features of these imaging systems. Based on the recent successes with the first prototype of the Helmet_PET dedicated brain imager, and as a result of his involvement in the AMPET collaboration (www.pethelmet.org), Dr. Majewski’s current focus is on developing several variants of the brain PET imager, both lightweight wearable devices for basic neuroscience applications, as well as an optimized TOF PET brain scanner. This scanner will have a tenfold increase in sensitivity in cases of dementia, stroke, TBI, cancer, etc. Several funding scenarios and international partnerships or consortia are being sought to advance the goal of getting multi-source funding to develop these devices. Dr. Majewski’s main collaborator in this project is Dr. Julie Brefczynski-Lewis from WVU, his research partner from the time he was at WVU and the PI of the AMPET project. 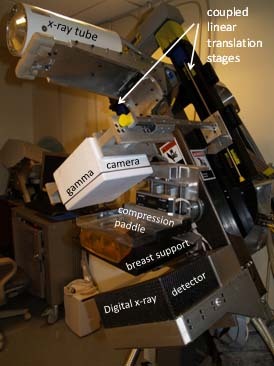 Also, the DOE Office of Science provided additional resources for the double-sided gamma breast imager and high resolution gamma camera for dual-modality breast imaging (both projects with the University of Virginia). The Jefferson Lab detector group that Dr. Majewski led at that time participated in the early stages of the development of the PEM breast imager with Dr. Irving Weinberg, the inventor of the PEM (at that time at NIH, Bethesda, MD) that became the Naviscan breast imager. Dr. Majewski has also played a leading technical role in two successful collaborative efforts, with Duke University and with West Virginia University, to develop a dedicated Positron Emission Mammography system (funded by DOE and DOE/NIH grants, respectively) to detect and guide biopsies of small cancerous breast lesions. A dedicated PET breast imager, based on a patented concept and built by the Jefferson Lab group, is now at UVA undergoing clinical trials. The key patented concept is assuring good visibility of the base of the breast (a deficiency of practically all prior-built dedicated PET breast imagers is that they are missing cancer lesions located close to the chest wall). As a related project, Dr. Majewski is assisting with implementation of improvements in the FDA-approved MAMMI PET breast imager produced by Oncovision, Spain. The second most important but relatively new research activity with great potential, is the development of dedicated brain imagers, primarily wearable PET imagers. In addition to the related patents, Dr. Majewski obtained funding from WVU/DOE to build Helmet_PET—the first fully wearable brain PET. Recently he has led the validation effort of the first prototype of the Helmet_PET –the first wearable mobile brain PET imager. The current AM-PET project Ambulatory PET imager is an intellectual extension of that concept (www.pethelmet.org). Dr. Majewski was the initial PI on this project, which was funded by an NIH R24 Brain Initiative grant. Partners involved in this project included West Virginia University, University of Virginia, UC Davis, University of Washington, and GE Global Research Center (Niskayuna, NY). The next step will be to develop the variant of the upright high performance PET brain imager which will be combined with Virtual Reality technology for early detection of Alzheimer’s. To assist with surgical margin definition, Dr. Majewski has designed several gamma imaging probes and small gamma imaging cameras for applications in the OR, during biopsy guidance and in radiotherapy. Several camera prototypes were constructed by the group he led at Jefferson Lab and some were tested in clinical trials at UVA. Recently, Dr. Majewski assisted with validations of the FDA-approved Sentinella mobile surgical imager (Oncovision, Spain) and with the new prototype of the hand held surgical imager under development by the UVa/ Jefferson Lab/ Dilon Technologies team (project leader – Dr. Mark Williams). He has also designed a PET imager to assist with proton therapy treatment. Working with partners in Michigan, Dr. Majewski developed a prototype of an intracavitary PET probe to provide high resolution images of the prostate in conjunction with the PET scanner of just modules. The system he invented and built at WVU achieved 1.0-1.5mm-planar resolution within the prostate. When finally implemented and combined with the new prostate imaging agents such as F18-PSMA, this system will provide substantial improvement in the early diagnosis of prostate cancer and provide assistance to the TRUS technique in biopsy guidance. His role was one of two PIs on the DOD Synergistic Idea Development Award for “High Resolution PET Imaging Probe for the Detection, Molecular Characterization, and Treatment Monitoring of Prostate Cancer”, 2009-2012. The continuation of this development is planned through the submission, together with Johns Hopkins, of the R01 grant on MRI compatible TOFPET imager with “1mm” resolution with TOFPET technology from Philips. From the very beginning of his work with biomedical imaging instrumentation, Dr. Majewski was working on small animal imaging systems, SPECT and PET, also paired with CT. His research partners included several groups in the country: Johns Hopkins, NIH – Bethesda, UVA, VCU-MCV, William and Mary, Case Western University, Columbia University, WVU and Northeastern University, and abroad with La Sapienza University in Rome, Italy, and several laboratories in Athens, Greece. The systems were demonstrated in different animal models of human diseases.